John McCain was a ‘rat’ or ‘stoolie’ telling on other U.S. officers being held captive at the Hanoi Hilton prison. When McCain first went to congress, members of congress turned their backs on him and did not communicate with him because of this, and also how he disgraced the military and his fellow officers who were severely punished by the North Vietnam guards and commanders of the Communist prison by McCain ratting them out. I am also led to believe that McCain was referred to as ‘the canary’ by the other officers for telling or squealing on the others. If you search the internet you will find some of these articles about what McCain did to his fellow officers in captivity and the stories of the other brave officers who reported on McCain upon returning to the United States. He was also given special treatment by the communists while in prison, because his father was a 4 star Admiral. Donald Trump was and is CORRECT! McCain was personally responsible for the deadliest fire in the history of the US Navy. That catastrophe, with 27 dead and over 100 wounded trumps McCain’s record as a prisoner of war in North Vietnam. The Navy released John McCain’s military record after a Freedom of Information Act request from the Associated Press. The record is packed with information on McCain’s medals and commendations but little else. The one thing that the McCain campaign does not want to see released is the record of McCain’s antics on board the USS Forestal in 1967. McCain was personally responsible for the deadliest fire in the history of the US Navy. That catastrophe, with 27 dead and over 100 wounded trumps McCain’s record as a prisoner of war in North Vietnam. 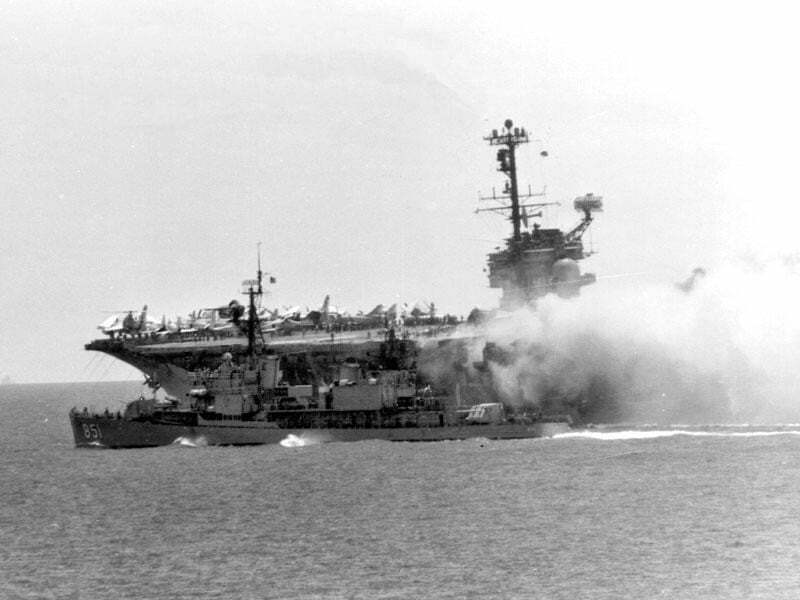 WMR has learned additional details regarding the deadly fire aboard the Navy aircraft carrier, the USS Forrestal, on July 19, 1967 in the Gulf of Tonkin. The additional details point to then-Lt. Commander John McCain playing more of a role in triggering the fire and explosions than previously reported. WMR has been informed that crewmen aboard the Forrestal have provided additional information about the Forrestal incident. It is believed by many crewmen and those who have investigated the case that McCain deliberately “wet-started” his A-4E to shake up the guy in the plane behind his A-4. “Wet-starts”, done either deliberately or accidentally, shoot a large flame from the tail of the aircraft. In McCain’s case, the “wet-start” apparently “cooked off” and launched the Zuni rocket from the rear F-4 that touched off the explosions and massive fire. The F-4 pilot was reportedly killed in the conflagration. “Wet starting” was apparently a common practice among young “hot-dog” pilots. McCain was quickly transferred to the USS Oriskany (the only Forrestal crewman to be immediately transferred). Three months later, McCain was shot down over North Vietnam on October 26, 1967. 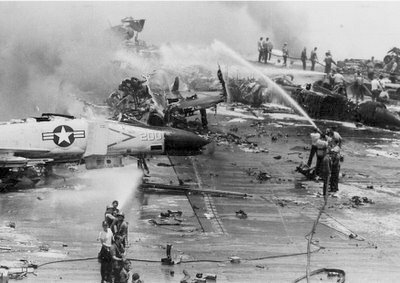 The fact that both McCains were involved in two incidents just weeks apart that resulted in a total death count of 168 on the Forrestal and the Liberty, with an additional injury count of 234 on both ships (with a number of them later dying from their wounds) with an accompanying classified paper-trail inside the Pentagon, may be all that was needed to hold a Sword of Damocles over the head of the “family honor”-oriented McCain by the neo-cons. WMR has also been informed by knowledgeable sources, including an ex-Navy A-4 pilot, the “wet-start game” was a common occurrence. However, it is between “very unlikely” and “impossible” for the Forrestal “wet start” to have been accidental. “Wet starts” were later rendered impossible by automated engine controls. Wayne Madsen reports on military and political affairs in Washington at his website, WayneMadsenReport.com. McCain Lies About Being Tortured As A P.O.W. (1) USAF Major Overly could not have cared for McCain’s “wounds” for very long; he collaborated and accepted early release in less than five months from shootdown. (2) Another of McCain’s roommates “disappeared” and was not released at Homecoming I. McCain was kept in the camp for “progressives” (collaborators) and away from “reactionaries” (John Wayne types who spit in the face of their torturers). Other roommates were Day and Flynn, both of whom made propaganda broadcasts along with McCain urging pilots to return to carriers and soldiers to surrender. (3) McCain returned from communist captivity 10 pounds heavier. (4) Patricia O’Grady, daughter of a POW/MIA, on a visit to Hanoi to look for her father, was given a tour of the “Hanoi Hilton” prison. They showed her McCain’s cell. It had a writing desk, a large bed, a goldfish bowl, a flush toilet and a nice window of downtown Hanoi out the window. (5) Both North Vietnamese Generals Giap and Bui Tin met with McCain in his cell. No other returned POWs reported meeting with high-ranking generals. I have a picture of McCain enjoying a large plate of food while talking to a Soviet KGB officer in the Foreign Ministry. A Soviet doctor was rushed to Hanoi to treat his wounds. (6) In personal conversations I have had with General Bui Tin, he assured me they never touched McCain, saying that since he was the son of the CINCPACFLT Admiral, “He too important”. (7) McCain said in 1973, he sustained his ordeal with his “love for his wife”. In a matter of months he had dumped her for a woman 1/3rd his age whose father owned the Coors Beer franchise in Phoenix. (His good friend Senator Kerry, about the same time, dumped his wife after fornicating with Jane Fonda.) McCain also has a secret “wife” in Hanoi and an illegitimate son. (8) McCain would sit beside with army officers at a table when newly-captured pilots arrived and urged them to cooperate. (9) McCain viciously fought against the formation of the Senate Select Committee on POW/MIA and then got on it and sabotaged any hopes of finding real answers. He called me and others crooks profiteering on the issue, yet he is the biggest loot recipient of the Keating Five. (10) If the “Crowned Prince” of the “Plantation” does not stop his outlandish lies about his “torture”, several of his fellow POW’s “will” soon break their “code of silence”. McCain is a brainwashed Manchurian candidate who has fawningly supported Hanoi and the Communist Bloc countries ever since he entered congress. The man is a liar, a traitor and a crook. Any senator who uses the word “scumbag” 20 times a day addressing his employees is not fit to serve. Also, CBS, you went on to a segment of a Latino who was on death row (wrongfully) in a “miscarriage of justice”. The biggest “MOJ” of this decade would be for traitor and Hanoi lover McCain to continue in office after the 1998 elections. P.S. McCain is the only returned POW NEVER TO BE DEBRIEFED. Source: CONTACT: THE PHOENIX PROJECT, October 27, 1997, Volume 18, Number 9, Page 10. Earl Hopper spent 30 years with the Army in Airborne Special Services and with Army Intelligence and he was a founding member of the National League of Families, dedicated to returning living POWs and MIAs of the Vietnam War. He and those interviewed allege that the narrative propagated by McCain, of his five and a half years as a Prisoner of War in North Vietnam is about as far from the truth as one could possibly imagine. They allege that McCain, from the very first moments of his capture behaved as a COLLABORATOR and propaganda tool for his North Vietnamese captors. McCain is described as engaging in no less than 30, and up to 38 anti-American propaganda broadcasts for Radio Hanoi during the period of his captivity. Far from the image of the dedicated American “hero” sweating it out in a North Vietnamese prisoner’s “hotbox” for five and half years, McCain was observed by fellow prisoners to be receiving special treatment by his captors, who were fully aware of his father’s and grandfather’s 4-star Admiral positions with the US Navy. Not a single contemporary captive interviewed here ever witnessed McCain’s alleged “torture” at the hands of his jailers and the consensus opinion of the other POWs in McCain’s camps was that McCain was actually NEVER tortured by the North Vietnamese. McCain’s disgraceful and wholly reprehensible conduct (along with that of John Kerry) during the 1991-93 Senate Committee on POW/MIAs, where McCain made massive efforts to block the release of classified documents and is described here as the person who did the “most harm” to the movement of families who wanted to rescue any remaining loved ones, left behind in Vietnam and Laos. McCain is described by those interviewed in this clip as perhaps the person who did the most to quash this movement – and they suspect that this was because he didn’t want the truth to be revealed by them. To them, his actions leave no doubt that McCain is a traitor to this country and its veterans and especially, to the [POWs and MIAs and their families]. Eighteen months ago, TAC publisher Ron Unz discovered an astonishing account of the role the 2008 Republican presidential nominee, John McCain, had played in suppressing information about what happened to American soldiers missing in action in Vietnam. Below, we present in full Sydney Schanberg’s explosive story. Bitterly opposed by the Pentagon (and thus McCain), the bill went nowhere. Reintroduced the following year, it again disappeared. But a few months later, a new measure, known as “the McCain Bill,”suddenly appeared. By creating a bureaucratic maze from which only a fraction of the documents could emerge—only records that revealed no POW secrets—it turned the Truth Bill on its head. The McCain bill became law in 1991 and remains so today. So crushing to transparency are its provisions that it actually spells out for the Pentagon and other agencies several rationales, scenarios, and justifications for not releasing any information at all—even about prisoners discovered alive in captivity. Later that year, the Senate Select Committee was created, where Kerry and McCain ultimately worked together to bury evidence. In the transcript, General Quang told the Hanoi politburo that 1,205 U.S. prisoners were being held. Quang said that many of the prisoners would be held back from Washington after the accords as bargaining chips for war reparations. General Quang’s report added: “This is a big number. Officially, until now, we published a list of only 368 prisoners of war. The rest we have not revealed. The government of the USA knows this well, but it does not know the exact number …and can only make guesses based on its losses. That is why we are keeping the number of prisoners of war secret, in accordance with the politburo’s instructions.” The report then went on to explain in clear and specific language that a large number would be kept back to ensure reparations. John McCain—now campaigning for the White House as a war hero, maverick, and straight shooter—owes the voters some explanations. The press were long ago wooed and won by McCain’s seeming openness, Lone Ranger pose, and self-deprecating humor, which may partly explain their ignoring his record on POWs. In the numerous, lengthy McCain profiles that have appeared of late in papers like theNew York Times, the Washington Post, and the Wall Street Journal, I may have missed a clause or a sentence along the way, but I have not found a single mention of his role in burying information about POWs. Television and radio news programs have been similarly silent. The above compendium of the articles about the past behavior of John McCain tell it all. As McCain is now running for a fifth term as U.S. senator for Arizona, these articles are being posted once again in an effort to inform more Arizona voters and the American people about McCain past behavior. On November 8, 2016, Arizona voters either reelect John McCain for a fifth term, knowing that he has lied to and deceived the them and the American public throughout his political career, or they will finally do the right thing and run McCain out of office, and replace him with a more honest, honorable and deserving individual. The U.S. Senate and the Republican Party will do just fine without John McCain. In review: John “McCain was personally responsible for the deadliest fire in the history of the US Navy. That catastrophe, with 27 dead and over 100 wounded’ and over $72 million in aircraft damage, eclipses ‘McCain’s record as a prisoner of war in North Vietnam.” McCain has admited: “I’m not a war hero.” , but for nearly 50 years he has allowed falsehoods to be reported about himself by the controlled media and his colleagues in the Washington Establishment. They have repeatedly claimed that John McCain is a “war hero” and that he was tortured by his captors while “imprisoned” at Hanoi.